It seems strange talking about a free UFC card and a Bellator PPV card being on the same weekend as the roles are usually reversed. Bellator NYC aired Saturday night while the UFC’s free card in Oklahoma City aired on Sunday night. Looking back, neither card impressed a whole lot. The Bellator card was stacked with some of the biggest names in MMA, yet it still seems odd that the 2 main even fights (as described by them) were ahead of 3 title fights on the card. Phil Davis and Ryan Bader and their light heavyweight title fight were buried on the prelims of Bellator 180 on free TV channel Spike. Their fight was less than thrilling, much like their first encounter, but that still seems like a slap in the face, especially since both men were big names from the UFC. The rest of the card saw the best welterweight in the world, as told by Scott Coker, Douglas Lima defend his title against newcomer Lorenz Larkin on the opening fight of the PPV portion. That fight failed to live up to its hype as well, with a rather easy decision win for the defending champion. The second fight on the prelims saw one of MMA’s hottest prospects in Aaron Pico tap to a guillotine choke in just 24 seconds. Billed as the next big thing in MMA, the hype train was derailed quickly by Zach Freeman, who did exactly as he said when he shocked the world. The third fight on the card featured a title fight between defending champion Michael Chandler and undefeated prospect Brent Primus. This fight ended in bizarre fashion as the NYSAC-appointed referee called the doctors in to look at Chandler’s ankle, which had him hobbled, without an illegal strike occurring. The doctors, shortly thereafter, waved off the fight and the title switched hands in a less-than-desirable fashion. 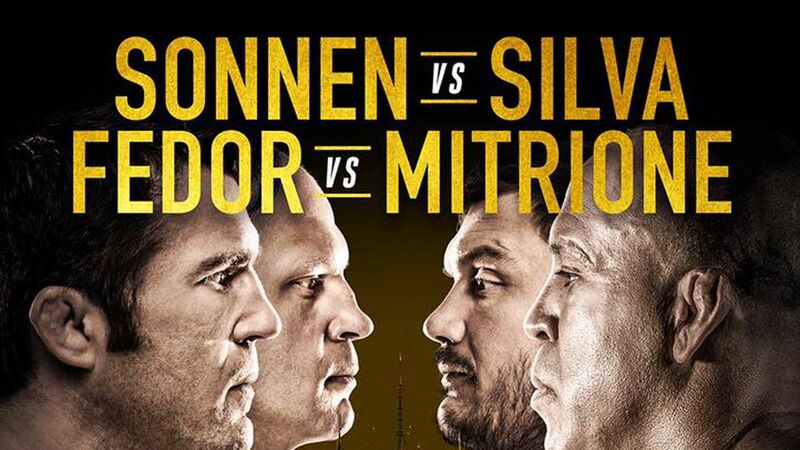 The first of two main events featured MMA great Fedor Emelianenko against former UFC heavyweight Matt Mitrione. Their fight was cut short in the first round when a double knockdown occurred but Mitrione was able to recover first and land a few more strikes to steal the win. The main event saw Chael Sonnen doing what he does best, talking trash and outwrestling his opponent. He took a unanimous decision from Bellator newcomer Wanderlei Silva, although their rivalry seems far from over. Chael reminded the crowd how much he hates New York, called out Fedor for a fight (and for wanting an autograph) and was subsequently pushed by Silva on his way out of the ring. In a nutshell, that was Bellator’s PPV in Madison Square Garden and it did not go the way they wanted it to. Scott Coker predicts this card to have done around a quarter-million buys, saying that anything over 300k buys would be a big hit. UFC Fight Night 112 was headlined by lightweight contenders Michael Chiesa and Kevin Lee. 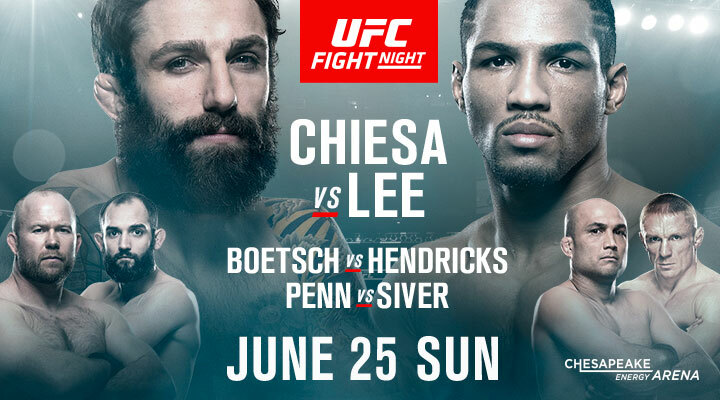 This fight was a grudge match in the making, with Lee and Chiesa throwing punches at a press conference months ago when Lee referenced his opponent’s mother. This fight was supposed to produce a future title contender at 155 pounds but instead it has been clouded with controversy. Lee had a deep rear-naked choke sunk in on Chiesa and although Chiesa looked to be in trouble, the fight was called off by Mario Yamasaki prematurely. The media, the fighters and even Dana White have let him know how they feel about the early stoppage. A rematch between the two seems inevitable but Lee was able to successfully pick a fight with second-ranked Tony Ferguson after the show. The main card kicked off with former champion BJ Penn taking on Dennis Siver. BJ looked nothing like the fighter who held titles in two weight classes, getting beat by unanimous decision in rather convincing fashion. Aside from a counter punch that dropped Siver, he had nothing to offer to German and his kickboxing. The second fight between Tim Means and Alex Garcia was a close contest with Means taking a unanimous decision and climbing higher up the welterweight ladder. The light heavyweight division was put on notice in the third fight with newcomer Dominick Reyes ending Joachim Christensen’s night in just 29 seconds with hard lefts. Reyes has now finished 6 of his 7 professional MMA fights in the first round and is a name to watch in the future. Felice Herrig and Justine Kish experienced their own strange night, with Kish losing control of her bowels at some point in the fight and being taken to a decision. The co-main event saw Johny Hendricks, who now missed weight as a 185-pound fighter, lose to longtime middleweight Tim Boetsch with a high kick and follow-up uppercuts. The main event sealed the MMA universe’s fate for the weekend with a bizarre ending to a great main event fight. In summary, neither promotion’s fight cards went the way they probably wanted them to. A new lightweight title contender was supposed to emerge, MMA’s next big thing was supposed to win easily, Larkin and Lima were supposed to go to war with their fists. None of those things happened. It wasn’t all bad news for the promotions though as Zach Freeman and Dominick Reyes emerged as potential future stars. Neither promotion had a complete fail of a weekend, but the UFC had a few top 10 stars on their card while Bellator had all of their stars on theirs.